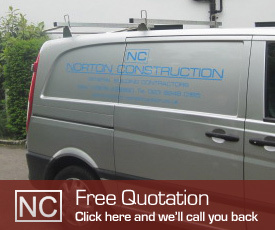 Norton Construction is a highly regarded building company that delivers domestic building services and maintenance works across the South East of England. Specialising in modern and traditional building techniques, we deliver projects for modern built and grade-listed properties ranging from small extensions to larger scale extensions or entire property renovations up to the value of £300,000. We have built a solid reputation for always performing to the highest standards of integrity, competence, service and technical ability. Our objective is to always exceed our customers’ expectations and deliver an excellent service at all stages of the project using environmentally responsible techniques and general practice. By listening to our customers’ requirements we can help them to realise the potential of their investment and ensure the finished result meets practical, aesthetical and environmental needs. We offer a complete support and step-by-step service from start to finish. This includes all paper work, plans, face-to-face meetings, sourcing of an architect and building permits. All projects are fully documented and priced before commencement. "Norton Construction did a very good job and we would have no hesitation in hiring them for further work." "Business like approach, quality work, know how, versatility, professional finish, value for money." "Norton Construction, under Ian’s leadership, made the extension of our home as least disruptive as possible."